We pride ourselves in the quality of this product. It's not a cheap imitation, our Aluminum frames really are good. 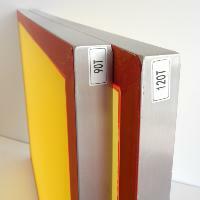 The standard sizes quoted are all constructed of a 30mm x 30mm Aluminum Box section. Now you've chosen your frame and mesh, why not take a browse through our Screen Printing Inks section to see our vast range of quality products.